Green Beans Almondine: A simple, yet impressive and flavorful way to serve fresh green beans in a lemon butter sauce. One of my favorite vegetables growing up was canned green beans. While I have little desire to eat canned green beans now, I do still love green beans. I love green beans simply steamed or dressed up a little, as they are in the classic recipe for Green Beans Almondine. 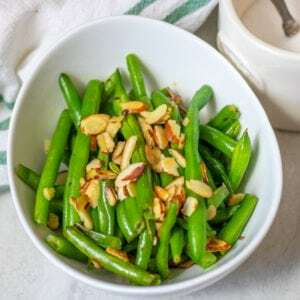 Green Beans Almondine is a French dish but simply means “green beans with almonds”. This dish is the opposite of complicated, yet it has a great presentation and a fabulous taste. 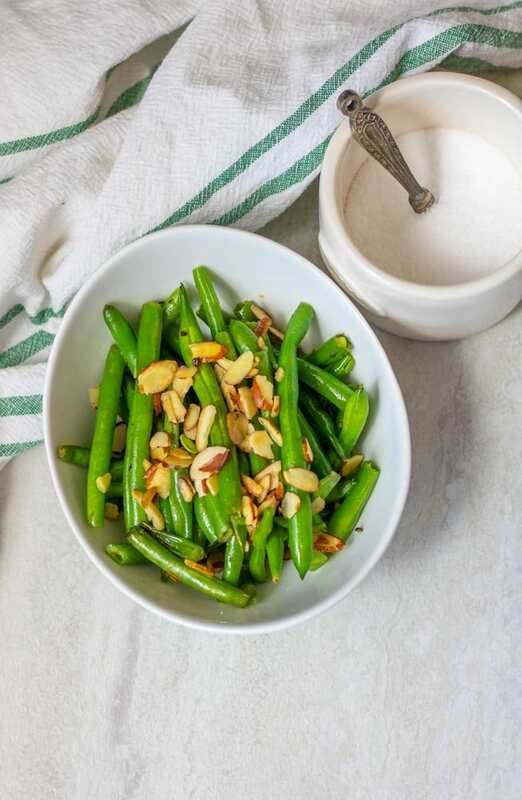 Buttery, crisp-tender green beans topped with toasted almonds for crunch and an added flavor, this side dish is almost effortless to make. Blanching green beans is essential to this dish. Blanching just means to boil something lightly and then to shock in cold water. Season heavily with salt–about 1 tablespoon. Drop green beans into boiling water and boil for 2-3 minutes, or until just crisp tender. Remove green beans from pot with a slotted spoon or spider strainer and place immediately into an ice bath. The ice bath is simply a bowl of water filled with ice water. This cold water helps to shock the beans to stop the cooking process, which keeps the green beans crisp and bright green. You can purchase toasted sliced almonds, but it is easy to toast almonds at home and will result in the freshest flavor. Preheat a large skillet over medium-low heat. Shake the pan every 30 seconds. As soon as your nose begins to smell the almonds, or the almonds begin to turn light brown, remove the almonds from the skillet. Remove green beans from ice bath and gently pat dry. In the same skillet you toasted almonds in, melt butter over medium heat. Add in green beans and toss to coat. Give the beans a squeeze of fresh lemon juice and season with 1/2 to 1 teaspoon salt to taste. Saute until warmed through, about 3-5 minutes. Remove green beans from skillet and place onto a serving platter. Top with toasted green beans. You can make green beans almondine with steamed green beans well. This method works great if you choose to use a bag of Frozen Green Beans that are designed to steam in the microwave or if you are starting with Instant Pot Steamed Green Beans. Steam green beans as directed. Lightly pat beans dry of excess moisture. Saute until warmed through, about 2-3 minutes. If you happen to be Vegan or Dairy Free, simply use olive oil in place of butter. Your green beans will not be a traditional French Dish, but they will still be delicious. 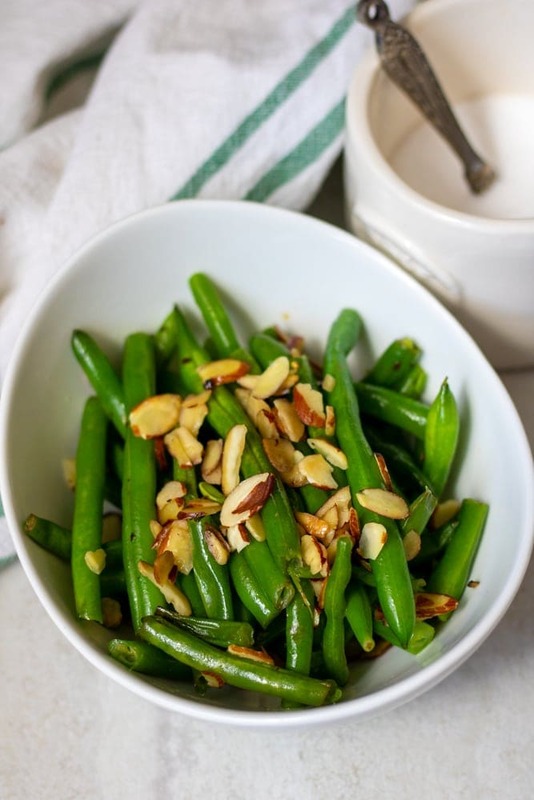 A simple, yet impressive and flavorful way to serve fresh green beans in a lemon butter sauce. Bring a large pot of water to a rapid boil. Season heavily with salt–about 1 tablespoon. Preheat a large skillet over medium-low heat. Add in slivered almonds. Shake the pan every 30 seconds. As soon as your nose begins to smell the almonds, or the almonds begin to turn light brown, remove the almonds from the skillet. In the same skillet you toasted almonds in, melt butter over medium heat. Add in green beans and toss to coat. Give the beans a squeeze of fresh lemon juice and season with 1/2 to 1 teaspoon salt to taste. Saute until warmed through, about 3-5 minutes. Remove beans from skillet and place in serving dish. Top with toasted almonds. I often make this without the fresh lemon juice and my kids actually prefer it! Do not substitute jarred lemon juice for fresh lemon juice. It can never be too easy Patrick 😉 Glad you enjoyed. I love classic dishes like this they compliment so many of our favorite entrees! Thanks Melissa! They really do taste so good with so many meals! Thanks Lori! It is easy and always impresses! Love this for a holiday side dish! One of the simplest and most classic ways to make green beans. Delicious! By my definition, the photo shows sliced almonds, not slivered. Slivered are small, half-moon shaped.